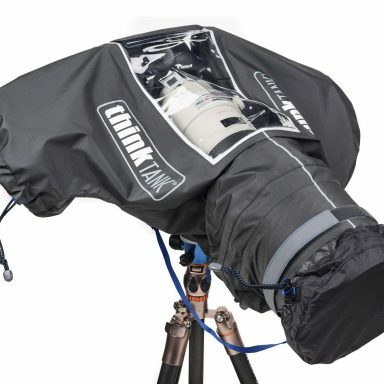 A camera rain cover is an essential part of any photographer’s kit. Some of the best photographic opportunities occur in less than ideal weather conditions, and if you have spent both time and money getting yourself in place then I’m sure you’ll want to come away with a shot or two. When shooting landscapes, the most dramatic skies often come in those brief moments before and after a storm. If you’re shooting wildlife you might search all day for your subject, only for it to appear right as the snow or rain begins to fall. If you’re covering a sporting event for a commercial client, you simply have to keep shooting, no matter what the weather is. Or perhaps you are simply on that once-in-a-lifetime family vacation and weather luck isn’t on your side. 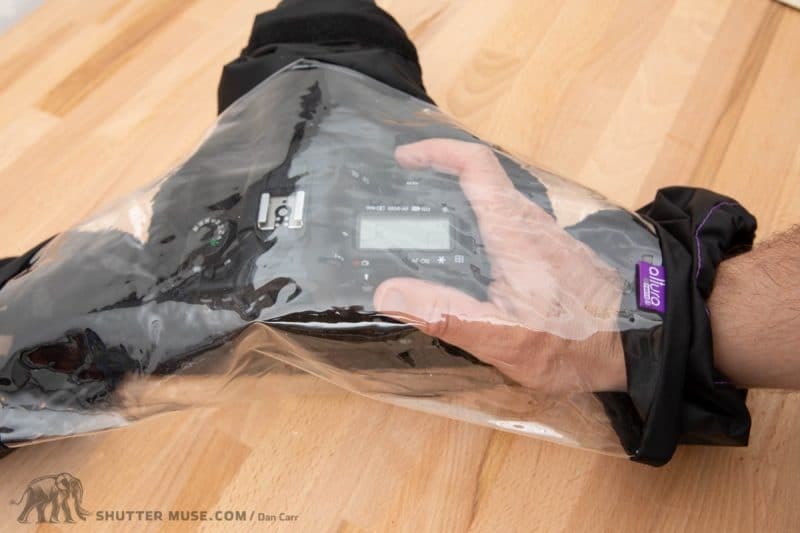 You’ve spent hundreds, possibly even thousands of dollars on your camera gear… you don’t need to ruin your chances of getting the shot because you didn’t spend an extra few dollars on a camera rain cover! 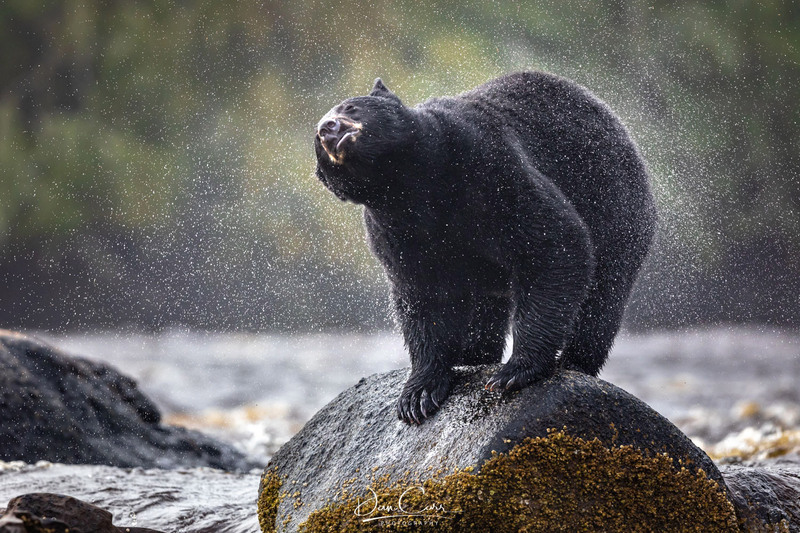 Without a top quality rain cover, I would never have had the opportunity to get this photo of a bear shaking the heavy rain off himself. Just one example of the many times that a cover has proved to be a valuable investment. 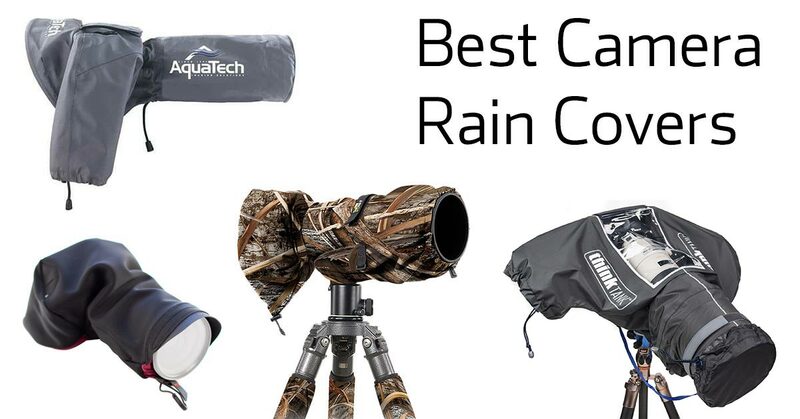 After much research and many years of testing covers during my professional career, I’m going to walk you through the best camera rain covers on the market in 2018. 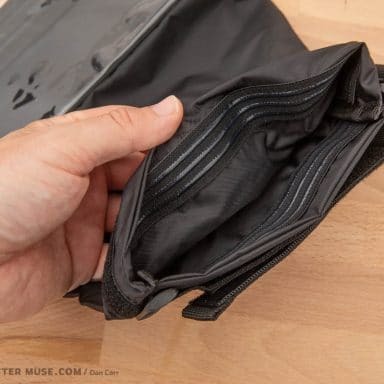 We will take a look at a variety of different styles of camera rain cover to suit different sizes of cameras and different price points, then I’ll make some recommendations for the best camera rain cover for specific types of photographers. 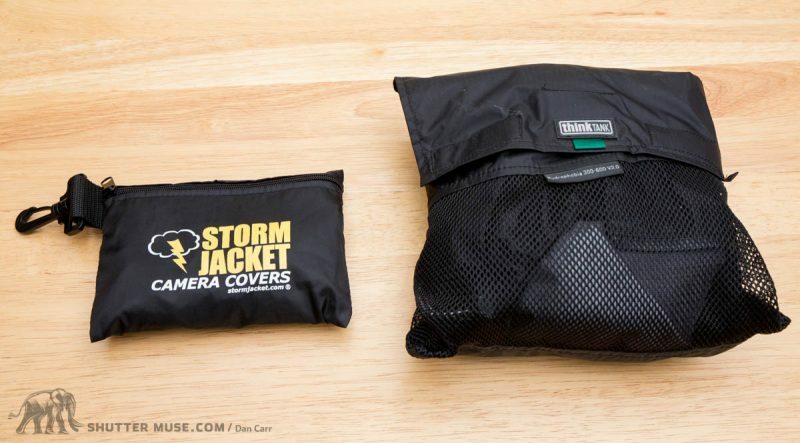 If you’re in a hurry and need a quick solution that’s cheap, packable and ten times better than a garbage bag, you can’t go wrong with the Storm Jacket series from Vortex Media as an emergency solution. Linked below is the medium black model, but if you click through you’ll find many sizes and colours. 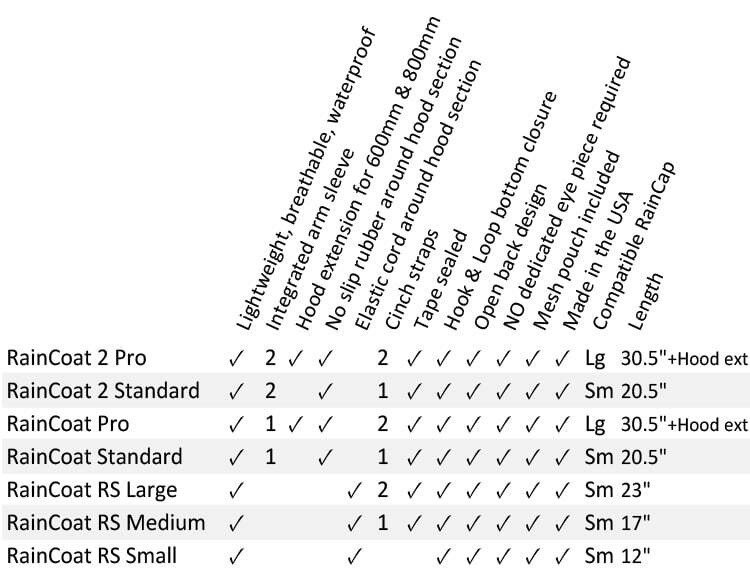 This table shows you the list of products that I’m going to be reviewing further in this guide. 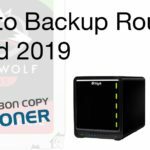 I didn’t choose these products blindly, so if it made it as far as being included in this gear guide at all then it has already shown some merit. If you don’t have time to read the in-depth guide then these links might save you some time. If you’re reading on a mobile device, the table might look better if you rotate your screen horizontally. *1 Click through to Think Tank’s store and spend more tan $50 to get a free gift. More details about this offer can be found here. 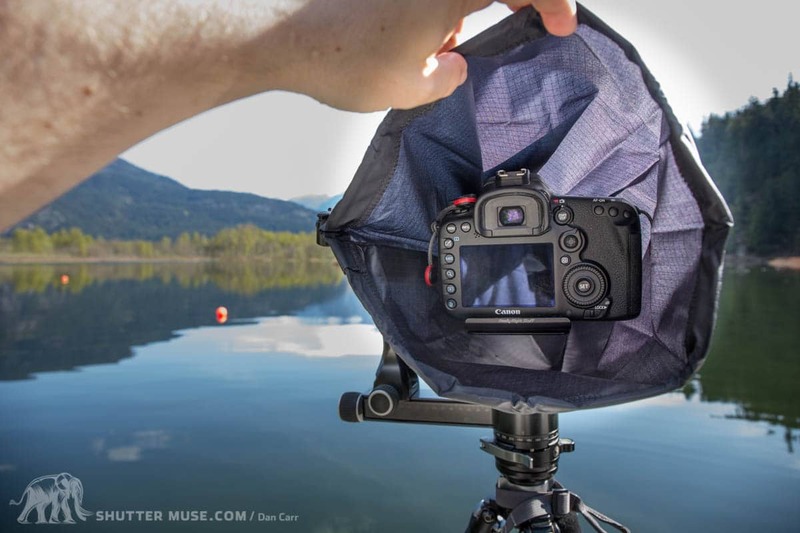 *2 Peak Design have offered a discount to Shutter Muse readers, click here for details. Having dedicated mirrorless options is great! All of the Hydrophobia covers come with a front element cover that is tethered to the main cover and can be used to stop water getting onto the front of your lens when you’re waiting to shoot, or walking around. I’ve always found that to be useful, and it surprises me that none of the other rain covers on the market offer this simple feature. 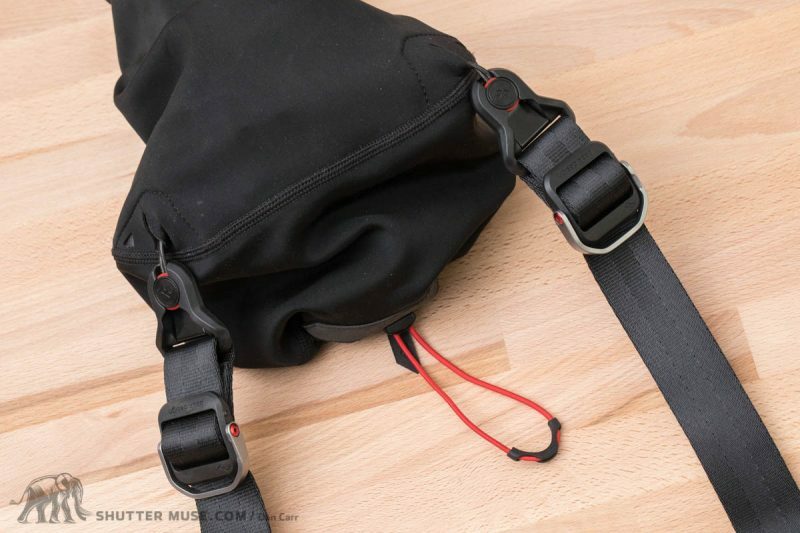 Another cool feature that is unique to the Hydrophobia series is that all of the covers except for the 300-600 version come with an integrated camera strap. 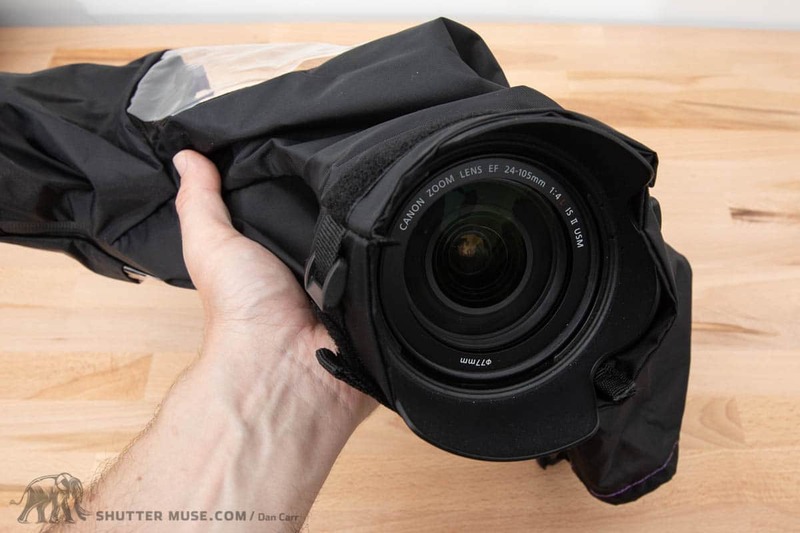 Inside the rain cover is a nylon loop that wraps around the lens to support the lens and body with the strap. That means that the weight of your camera isn’t hanging directly off the strap attachment point on the cover. Ingenious stuff! 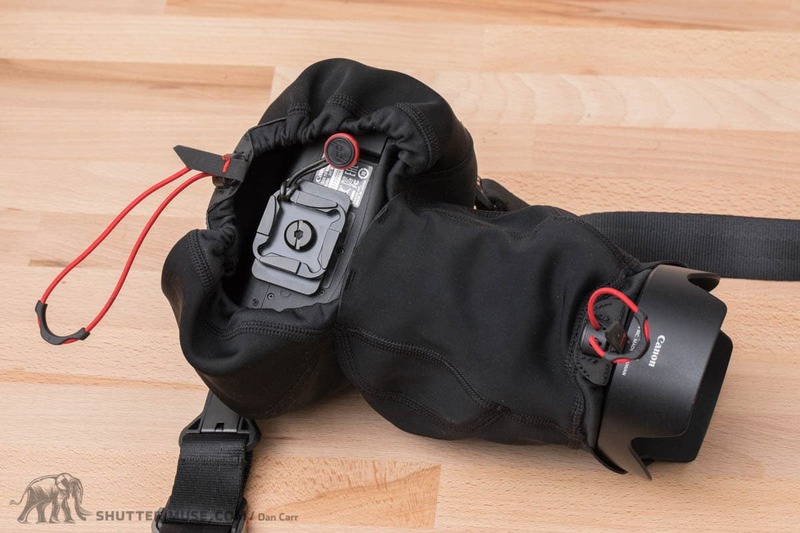 Don’t worry, if you have a favourite camera strap that you want to use instead of the supplied Think Tank one, you can attach it just as you would to a camera. Personally I like to use the Peak Design Slide straps with their quick release system so I can quickly remove the strap from the camera and attach it to the rain cover. The 70-200 and 24-70 models have an integrated neck strap. 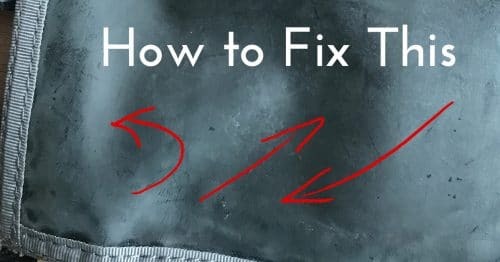 As well as the lengthy feature list, you also get Think Tank’s famed build quality and friendly customer service should you ever need it. 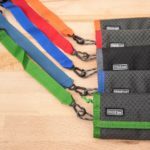 All the zippers are seam sealed, and all the stitched seams in the durable 3-ply nylon are taped just like a waterproof hiking jacket would be. 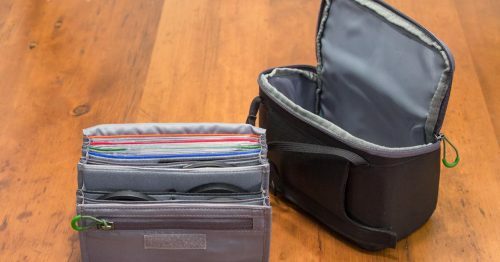 These covers are built for long-term professional usage so they do have price points that somewhat reflect that, but they certainly aren’t overpriced when you consider the quality of the construction, and features that other covers don’t have such as front covers and shoulder straps. The 300-600 V3 also has a neat trick to deploy the cover quickly. 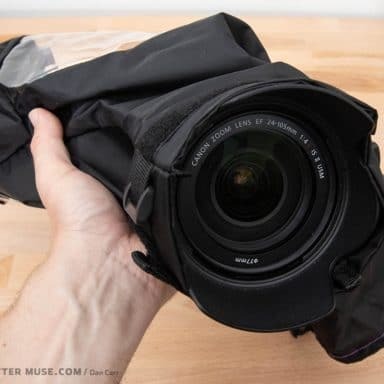 Rather than storing it in your bag, you can store it on the lens hood of your super telephoto lens by strapping it on and then folding the cover up into a pouch that wraps around the lens hood. This feature is designed for sports photographers who can’t afford to spend a lot of time attaching the cover if a rain storm strikes midway through a game. If you think you might have rain during your game/match/race, pre-install the cover onto the lens hood and then you can pull it over the camera in just a couple of seconds when the skies open. A quick scan of the sidelines at a major sporting event on a day with questionable weather will reveal a large number of these Think Tank Hydrophobia covers. One thing to be aware of is the need to buy a special eyepiece for your camera when you purchase the rain cover. This eyepiece is important because its needed to properly seal with the rubber gasket on the back of the cover. When you are weighing up your purchasing decisions, make sure you factor in the additional cost of the eyepiece which is $20. 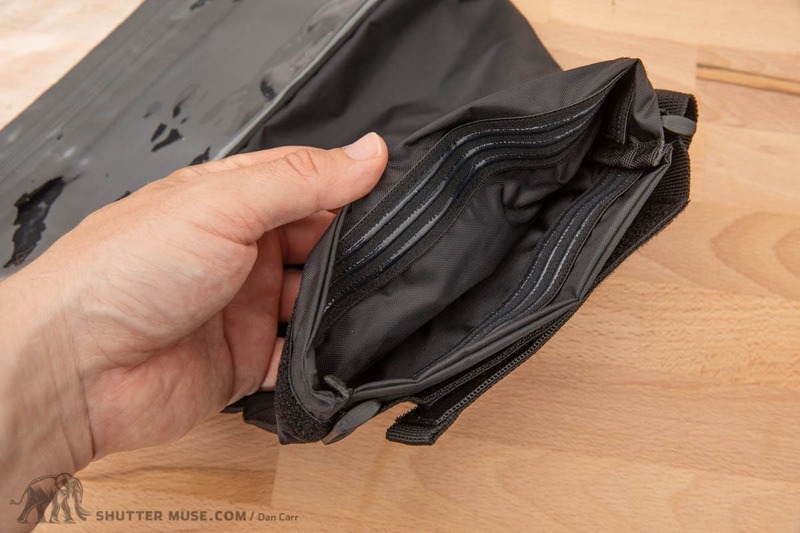 That extra cost might seem like an annoyance, but the same thing is also required with the Aquatech Sport Shield which is the only other cover on this list that’s on the same level as the Hydrophobia in terms of features, build and high-end materials. Note: As always with Think Tank products, you can get yourself a free gift if you spend more than $50 in their online store having clicked through one of my links, like this one. For more details on this offer, you can head here. Here you can see my Hydrophobia 300-600 in “quick deployment mode”. It’s not pretty, but it does the job well! From here you can pull the cover over the camera in just a couple of seconds if you already have the eyepiece installed. 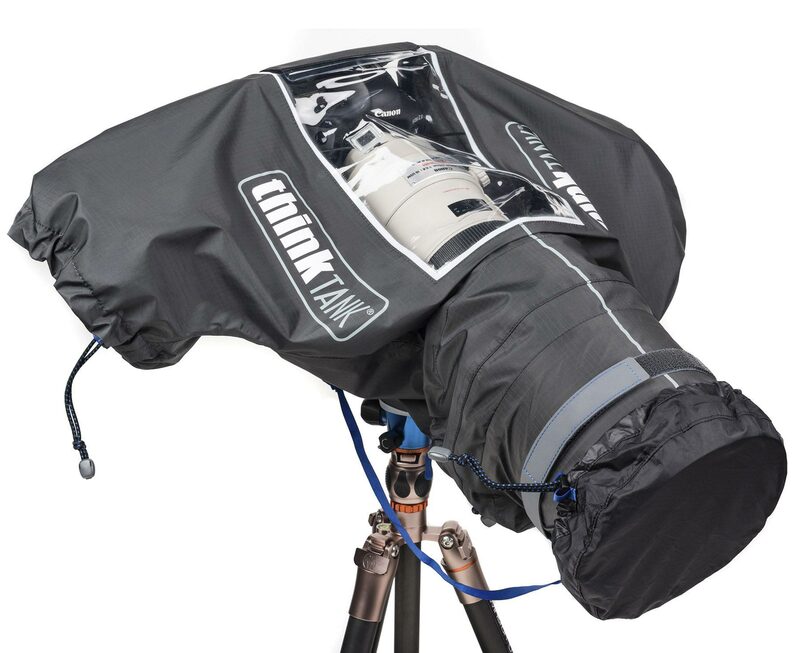 These rain covers are a simple tubular design with elasticated cords at both ends to cinch tight around the lens hood and the back of the camera. There’s plenty of room to slide your right hand under the cover to get to the camera and once you push your eye up to the viewfinder the cover has enough excess material that it still generally keeps the rain off the back of the camera. That said, you are a bit more limited if you are moving around a lot with the cover on. 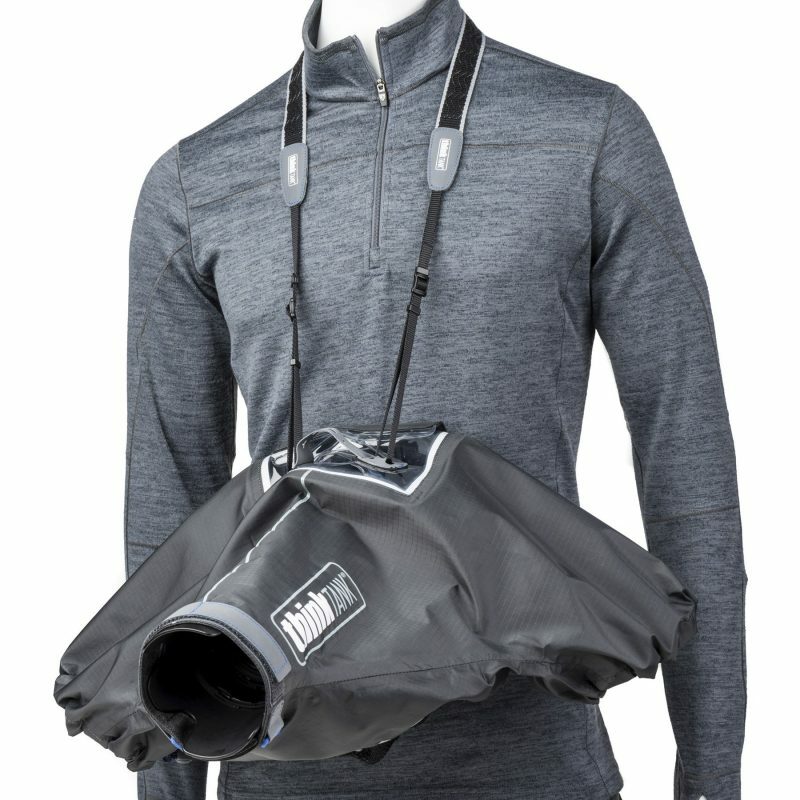 With something like the Hydrophobia, that has a fully enclosed back, you can really just carry it however you like and the rain won’t get to the camera. 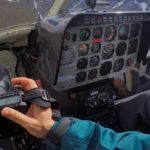 With the Storm Jacket, you have to think it a bit more carefully, and there’s no option to use a shoulder strap either. If I was planning on shooting prolonged outdoor events in the rain, I’d want to stick to one of the pro options like the Hydrophobia or the Aquatech Sport Shield, but for all other scenarios the Storm Jackets do a fine job at a nice low price. The Storm Jackets come in two variations: Standard and Pro. The only difference between the two is that the Pro version has a hook and loop closure along the bottom of the cover that can be used to poke a tripod or monopod though to the camera. As you can see in the photo above, it’s also handy for a gimbal head. To find the right length for your needs, combine the length of your camera and your lens and then add 2 or 3 inches to the total. The covers are highly compressible so it’s possible to buy one for your largest lens and still make it work with a much shorter lens. The thing I love about these covers is that they are so light that you can carry it in your bag all the time “just in case”. Some other rain covers are so big and bulky that you’d simply never take them with you unless you really thought there was a good chance of rain. With the Storm Jacket, you can stash it in a tiny pocket in your bag and you’ll just forget its there until the moment you need it. Storm Jacket size compared to Think Tank Hydrophobia. Get a size that leaves some excess material for you to cover the back of the camera with. There’s a drawstring to cinch it up tight. 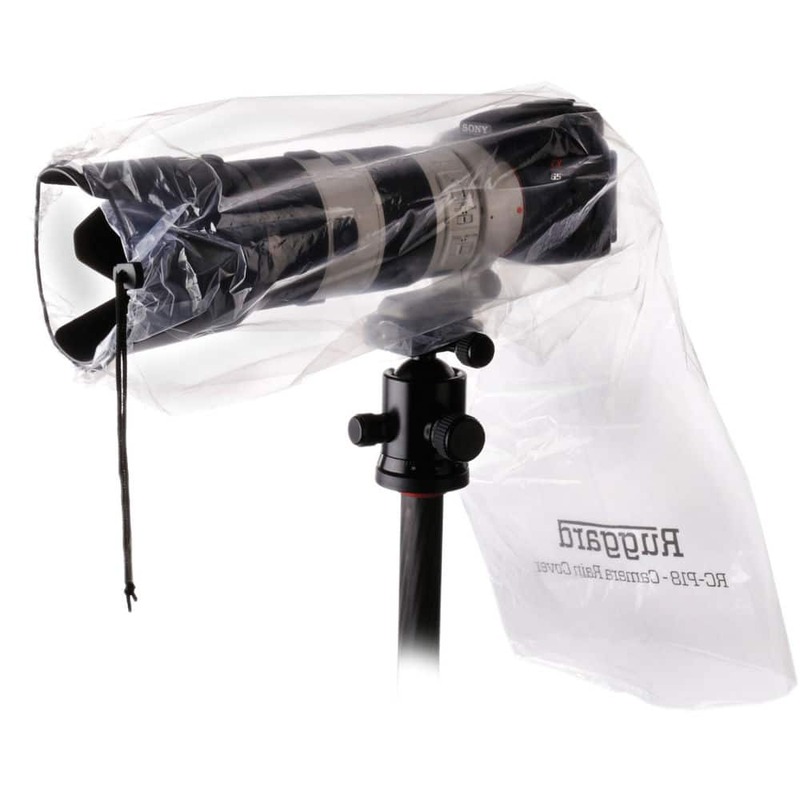 There’s a number of cheap, clear plastic camera rain covers on the market but the Ruggard P18 stands out from this crowd by offering enough additional plastic at the back of the cover to protect your hands from the rain. A single cover is available for under $7, and the P18 is available in a selection of different sizes to suit different cameras and flash combinations. If your budget is heavily constrained, this is certainly better than nothing, and better than a garbage bag. 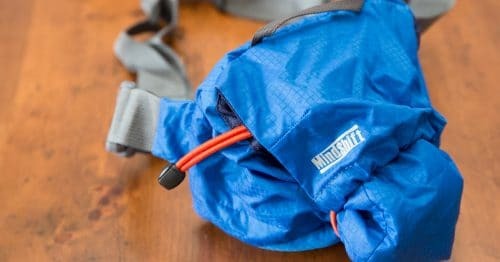 Personally I think it’s worth spending the $30-$40 on something far more robust like the Storm Jacket, but I wanted to include a super cheap option on the list as I know some people will appreciate that. If you’re going to go for the cheap plastic solution, I think this is the best of the bunch. Environmental note: In a world that is clearly generating far too much plastic waste, I urge you not to purchase a cheap plastic cover light the Ruggard P18 and only use it once. Please, if you are going to buy one of these ultra-cheap covers, do not treat it as a single-use product. When you are done using it in the rain, spread it out or hang it up to dry, and then pack it carefully away to use again. 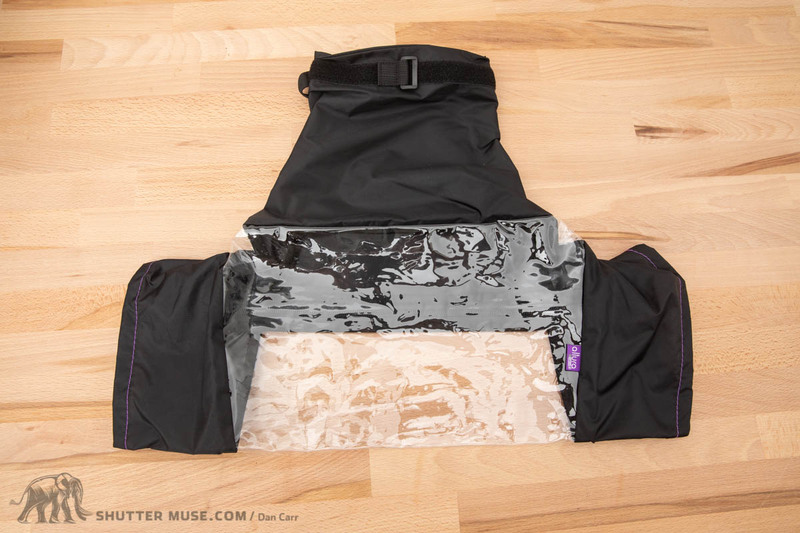 You obviously won’t get as many uses out of it as you would with the other nylon covers in this guide, but please try and make it last as long as possible. Let’s all make an effort to use less plastic so that more people can photograph the beauty of this planet. These are the covers that I most often choose to protect my gear while I’m working. In terms of quality feel, the Aquatech Sport Shield series stands out above the rest of the products on this list. 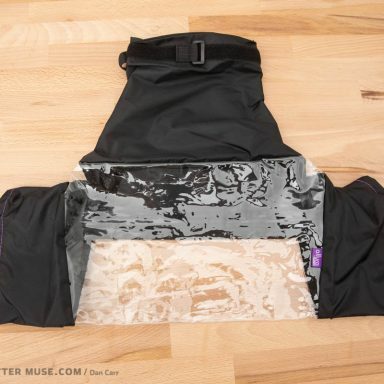 The materials are light but rugged, and the taped seams and seam sealed zippers just look and feel like they’re on a higher level than even the Think Tank products. This looks and feels just like a very high end waterproof jacket from a top brand such as Arcteryx, The North Face or Patagonia. Impressive when the price is so similar to it’s main competitor, the Hydrophobia series. 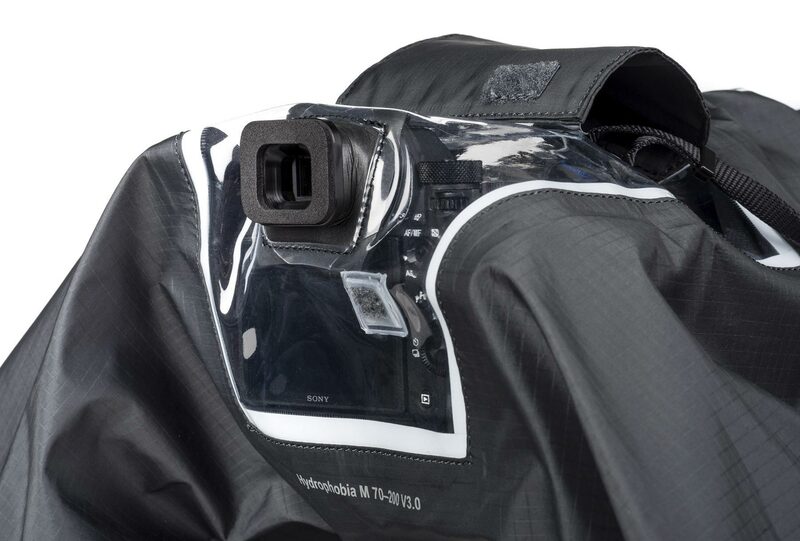 The Sport Shield has a fully enclosed back to it so you can carry your camera over your shoulder or on a monopod and not worry about rain getting in. 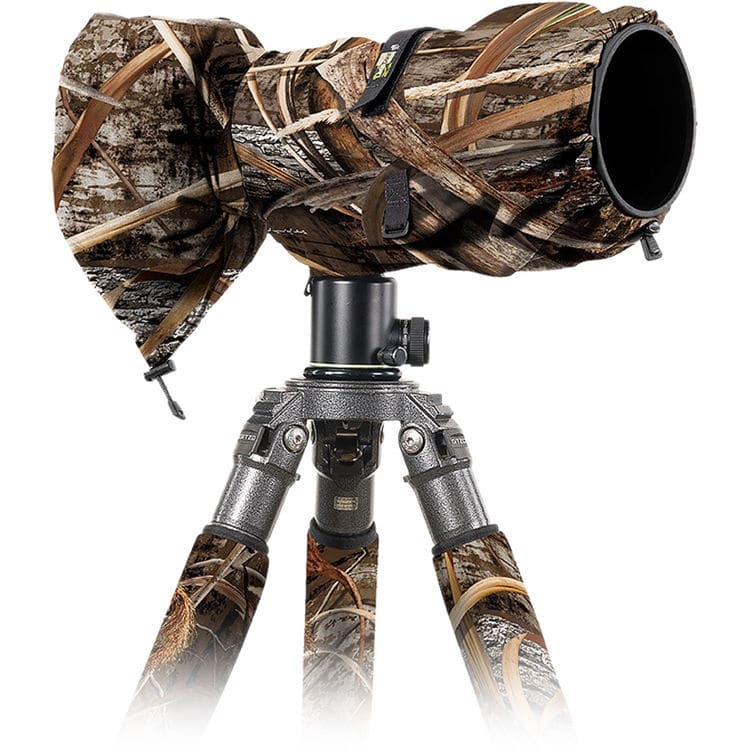 It also has a small hood that extends out over the eyepiece and the back of the camera to minimize the amount of rain drops that gather on the clear back of the cover when you are stopped and waiting to shoot. When you’re not shooting, there’s a an additional nylon cover that can be used to cover the clear plastic back and the eyepiece. 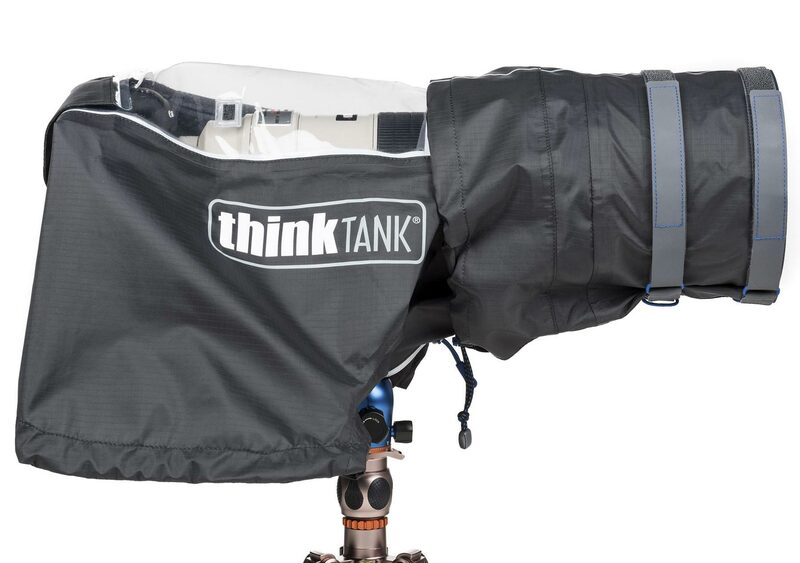 Similar to the Think Tank Hydrophobia, you need to order an additional eye piece for your camera to complete the fully watertight setup. I much prefer the comfort of the Aquatech eyepieces over the Think Tank ones, in fact I simply leave mine on the camera all the time! The downside to the Aquatech Sports Shield is that the sizing is more specific than it’s main competitor, the Think Tank Hydrophobia. If you use a large selection of lens sizes then you may well find that one cover isn’t enough. 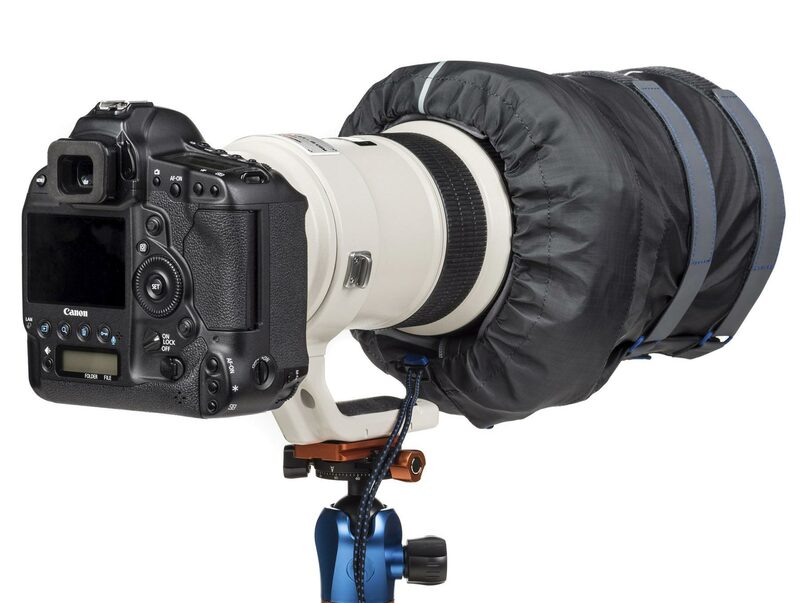 Carrying two covers is quite a lot of additional bulk to put in your camera bag though(and expensive to buy), so my usual solution is to pick the large Sport Shield to cover my tele zooms (70-200, 100-400) and my 400mm super telephoto lens, then pack a small Vortex Storm Jacket for use with short zooms. 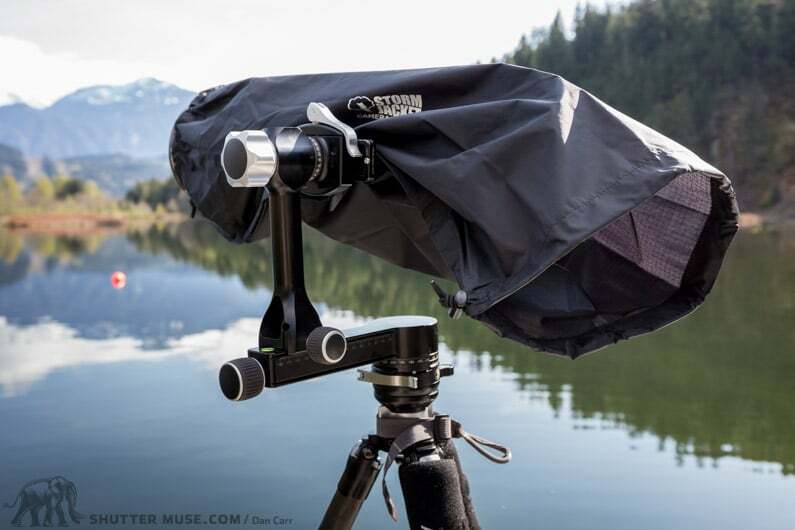 LensCoat have a large and somewhat confusing range of camera rain covers, but I’ve tested them and I’m going to simplify your choices to save you time because I think there’s only two worth considering at all. The RainCoat RS (rain sleeve) is the simplest rain cover that they make, and it’s essentially the same design as the Vortex Media Storm Jacket, but made from different materials. 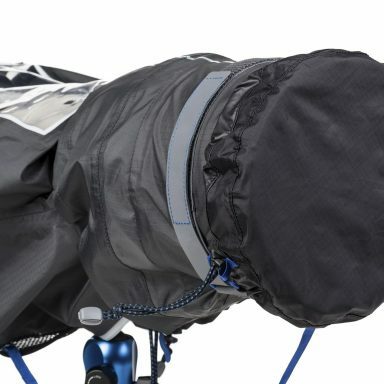 In other words, this is a no-frills kind of rain cover that’s basically just a tube of waterproof material that slides over your camera, with an opening at the bottom to poke a monopod or tripod through. The front and back of the RainCoat RS have drawstring-style closures, and there’s a strap in the centre of the cover that tightens the cover around the lens. 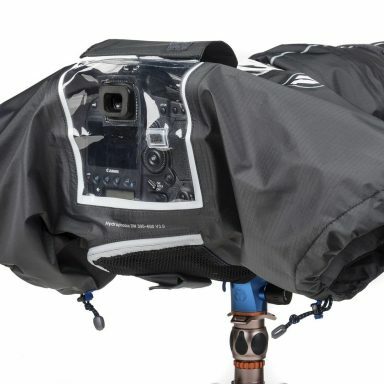 Since the RainCoat RS uses a much heavier material than the Storm Jacket from Vortex Media, it’s much bulkier and heavier to carry around in your bag. That’s a definite disadvantage for a more expensive cover, and it doesn’t offer any more protection from the rain to compensate for that. Where the RainCoat RS does have an advantage is the choice of camouflage patterns. I wouldn’t bother buying a black RainCoat RS because you can use the aforementioned Storm Jacket which is lighter and cheaper, but, if you need to camouflage yourself for wildlife photography then it might be worth considering one of the many RainCoat RS cammo patterns that are available, such as Realtree® Max4, Realtree® Max5 and Realtree AP Snow. 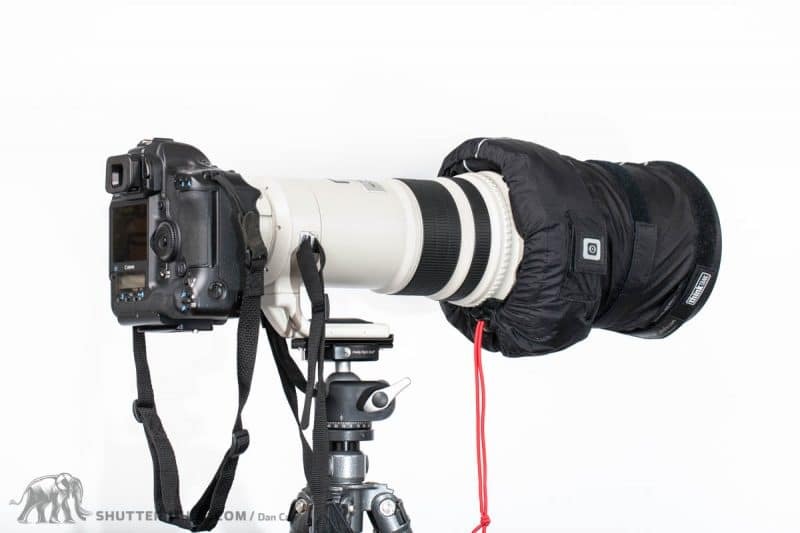 The LensCoat RainCoat 2 Standard is a beefed up version of the RainCoat RS with two arm holes to reach the camera body and the lens barrel. 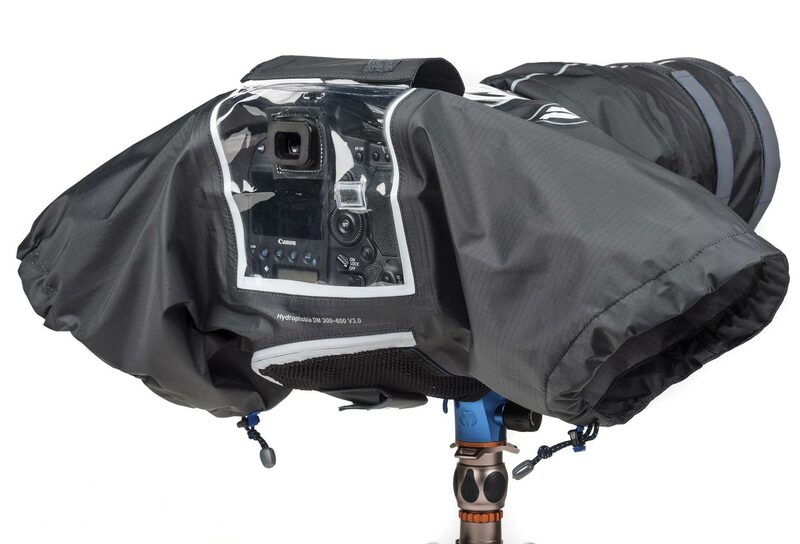 Unlike other big covers such as the Think Tank Hydrophobia or the Aquatech Sports Shield, the RainCoat 2 Standard has an open back design which some people do find easier to use. The simpler design also keeps the price point a little lower. None of the RainCoats from LensCoat are the cheapest or lightest covers in their class, so once again their main advantage is the possibility to get one with a camouflage pattern such as Realtree® Max4, Realtree® Max5 and Realtree AP Snow. If you need to camouflage yourself, this is the best option. If you are happy to have a basic black or grey cover then I would choose something else from this list. The Shell rain cover from Peak Design is a cool little cover for anyone that is also using the Peak Design Capture Clip (read my review). The Capture Clip allows you to carry your camera on a belt or the strap of your backpack, but of course this exposes it to the weather. 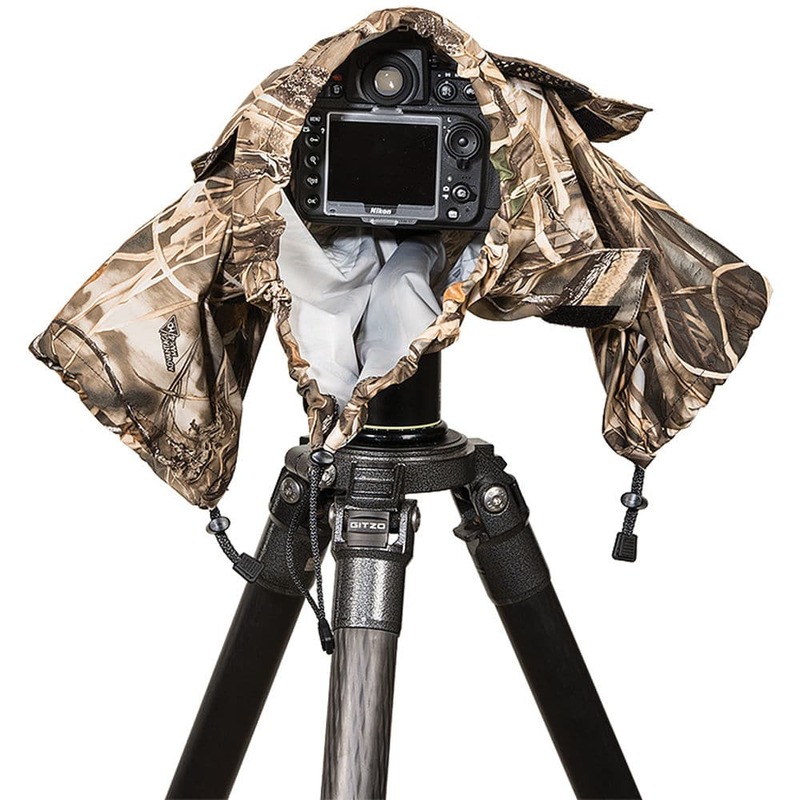 The Shell rain cover is designed to slip quickly on and off the camera while it’s attached to the Capture Clip. It’s important to note that this cover is designed to protect the camera while you are walking around with it attached to your body or bag. It is not designed to protect your camera while you are shooting. You cannot keep the Shell rain cover on the camera while you are shooting because it doesn’t have an eyepiece to look though! 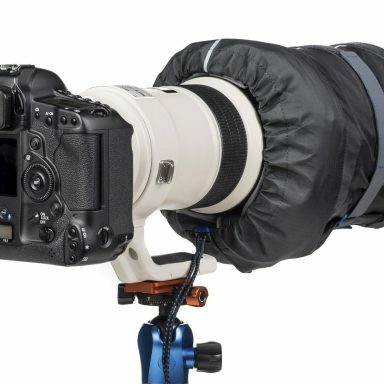 This does make its protection a bit more limited than most of the other covers on this list because it means your camera is going to get wet if you’re shooting in the rain or snow. 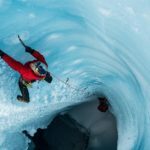 Whether that’s ok with you will largely depend on how much weather sealing your camera and lens has. There’s no doubt this is a disadvantage of the Peak Design Shell, but the advantage is that your camera is ready at a moment’s notice when it’s on the Capture Clip. So you might get your gear a little wetter, but you might also capture fleeting moments that you’d otherwise miss if your camera was stashed away inside a backpack. I’ll say it again one more time. The Shell is a cool cover, but it’s ONLY good for people that are using the Peak Design Capture Clip. It would be utterly pointless to buy this cover if you don’t have a Capture Clip. 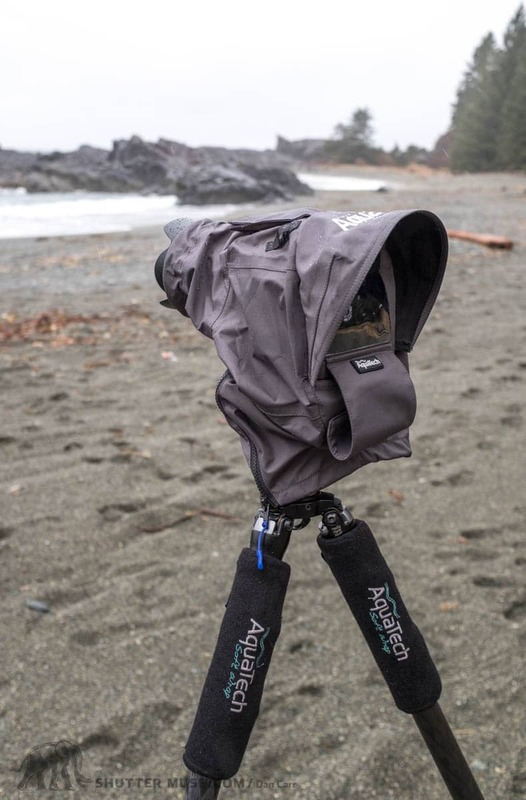 The Altura Professional Rain Cover is the best value camera cover on this list, selling for not much more than $10. From an environmental standpoint, I’d love to see people spending a few dollars more on this cover than the plastic ones that won’t last as long. With a 4/5 rating on Amazon after well over 1000 reviews, this is definitely one of the most popular rain covers. Seam sealed zipper on the bottom. Even though I could not get it from my local Amazon Canada store when I wanted to test it during my research for this guide, I was able to order it from the Amazon US store and pay only $8 in shipping to Canada, which still makes it a good price in my book. 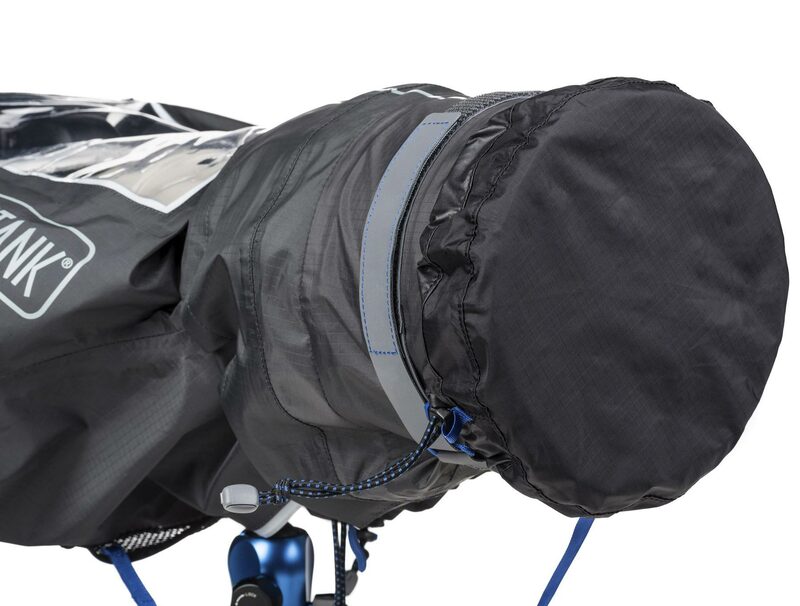 When you handle the cover there’s very clearly a difference in quality between the Altura rain cover and the more expensive options, but with care it will be fine for occasional emergency use. It’s certainly a significant step up from the clear plastic covers! One thing that you need to be aware of is that there is no eye hole in the back of the cover, so if you want to use the viewfinder then you have to peer through the plastic cover. For emergency use it works, or alternatively you could use liveview and look at the screen through the cover instead. The cover is available in just one size, which is a bit of a limitation since it feels quite big if you just use it with a small prime lens or a wide-angle zoom. It’s actually large enough to fit a 70-200! The RRS PG-01 side-arm gimbal. Most rain covers have an opening in the bottom of that that allows you to use them with a tripod. If you use a side-arm gimbal such as the Wimberley Sidekick or an RRS PG-01 without the cradle (my personal gimbal choice – see photo), this can narrow your rain cover options because you actually need an opening on the side of the cover and not the bottom. 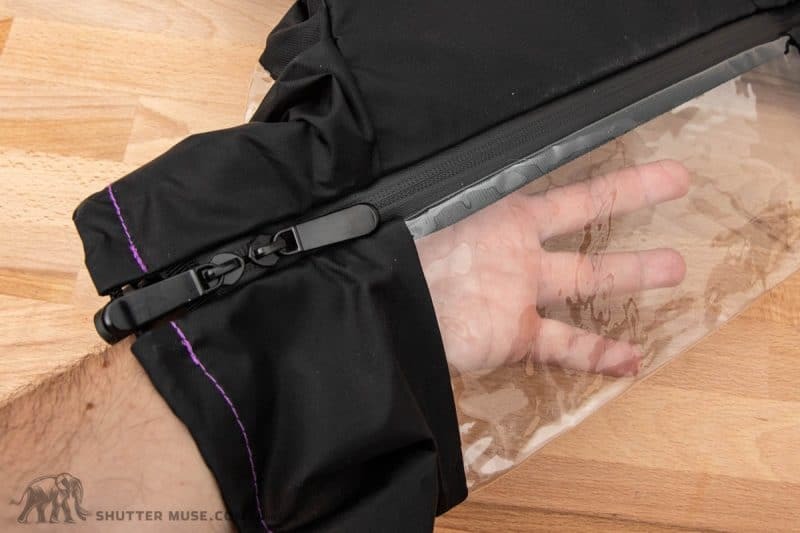 There are no rain covers on the market that are designed with this in mind, but you can make do by using a rain cover that has two arm holes in it. In this setup, you simply put the gimbal attachment through the left-hand arm hole, and if you need to control a zoom ring, you put your left hand up through the hole on the bottom of the cover that is meant for the tripod. This solution works very well with the Think Tank Hydrophobia 300-600, so that would be my pick for side-arm gimbal users. 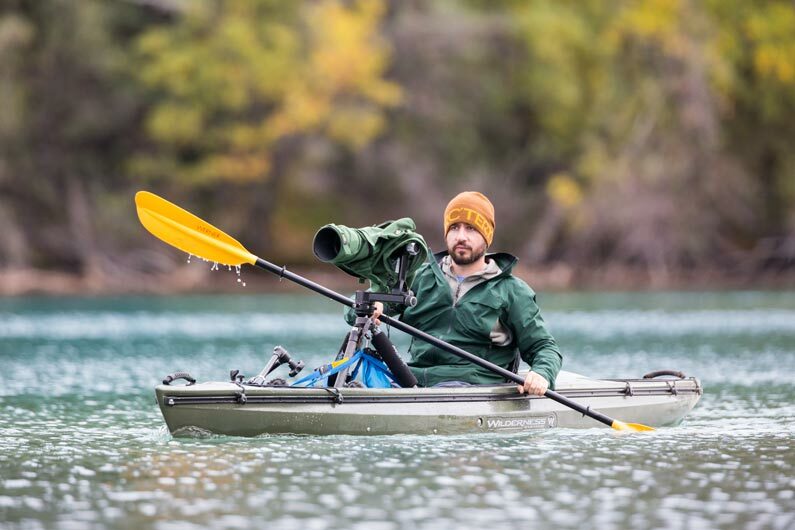 The assumption has to be that if you are using a gimbal then you must be using a large super telephoto lens, and that in itself narrows your choice to the Hydrophobia or the Aquatech Sports Shield. The Sports Shield only has one arm hole on the right-hand side though, and if you used that as a gimbal mount hole you wouldn’t be able to adequately reach the primary camera controls. 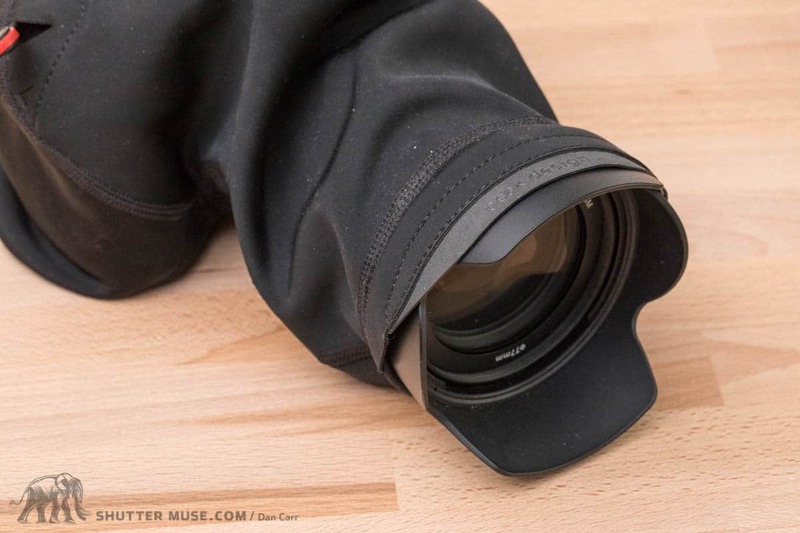 Note that certain LensCoat covers also have two arm holes, so these can be options as well if you need the camouflage. 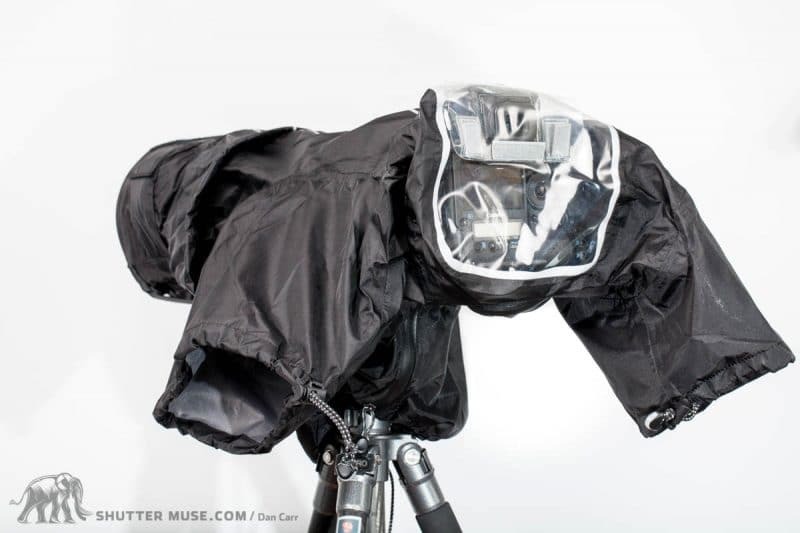 You may also have noticed that the photo of the Vortex rain cover also shows a side-arm gimbal setup. 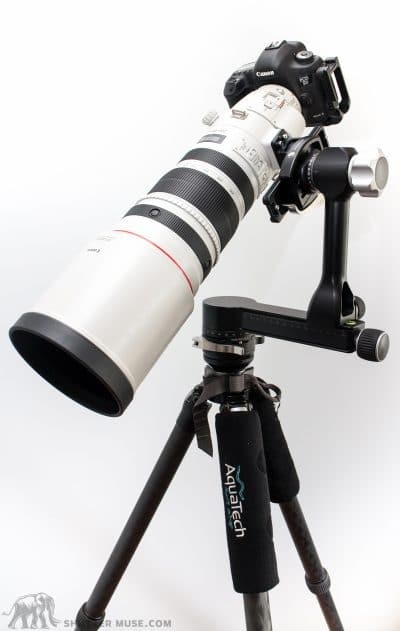 This is possible because without back cover and without a right-hand arm hole, you can simply rotate the whole cover 90 degrees and use the usual tripod entry point. Which Rain Cover Do You Use? I spent a great deal of time testing and researching camera rain covers to find what I believe to be the best solutions on the market right now, but it’s always great to hear from other photographers about their experiences. What kind of rain cover are you using right now, or which one are you thinking of buying? Interesting article and review piece, and to be honest it is not something I think much about. I’m an amateur hobbyist, so no commercial work or definite reason to HAVE to shoot in the rain. But you are right in that you never know when that opportunity may come. Of all of the reviewed items, I have the PD shell. In fact, I have two. I have found them very useful when out walking with the camera on the capture clip, especially when rain looks likely. And although the quality of the material is fantastic, as well as how they can be removed/attached with great ease, you are absolutely correct in that not being able to use the camera whilst the shell is on it is a definite disadvantage and quite a disappointment in an otherwise excellent product. I’ll need to have a think about which of the products, above, would suit me back home in rainy Scotland! Thanks for taking the time to comment, Scott! I’m glad it provoked a bit of thought.